You've just found Scaledown's first official schwag offer! It's an exciting time here and we would like to share some of this excitement with SD readers. 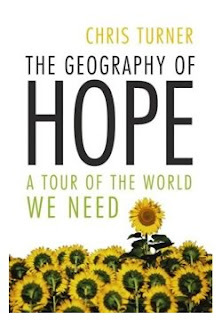 Over the course of this next week, we will be throwing all the names of everyone who comments on this blog entry into a hat, and the two names we draw out will receive a copy of Chris Turner's latest book, The Geography Of Hope. On Monday, Feb 18th, be sure to check back as we will be announcing the winners right here. As you know, Chris will be the keynote speaker at the SCALEDOWN UNVEILED event on February 20th at the Caboto Club, and this is where you will be able to meet the author and get you copy signed. So get those names in so we can get this book into your hands. Posted by Chris Holt at 7:41 a.m.
February 12, 2008 at 8:38 a.m.
Plese put my name in the hat. February 12, 2008 at 9:06 a.m.
plus you can never have enough books to read. February 12, 2008 at 9:44 a.m. Politics of HOPE IT IS!! February 12, 2008 at 2:07 p.m.
February 12, 2008 at 2:30 p.m.
Well if it keeps up for adriano, I'd be more than happy to take the second book! February 12, 2008 at 3:25 p.m. Pretty dust cover! count me in too! February 12, 2008 at 3:27 p.m.
Well I could probably borrow Holt's copy but I'd much rather win one, it's always great to win something and it's all in good fun. February 12, 2008 at 11:01 p.m.
February 13, 2008 at 5:37 a.m.
Great work Scale Down! This is sure to be a great event. February 16, 2008 at 7:23 a.m.